In Christian Waldvogel. Earth Extremes, the artist uses photography and digital imagery to examine our world within the solar system. So writes the architect, musician, and programmer Christian Waldvogel (*1971) in Christian Waldvogel. Earth Extremes, a collection of nine of his projects from the last several years. For the pieces in Christian Waldvogel. Earth Extremes, Waldvogel situates his point of view in space, using photography and digital imagery to examine our world within the solar system. 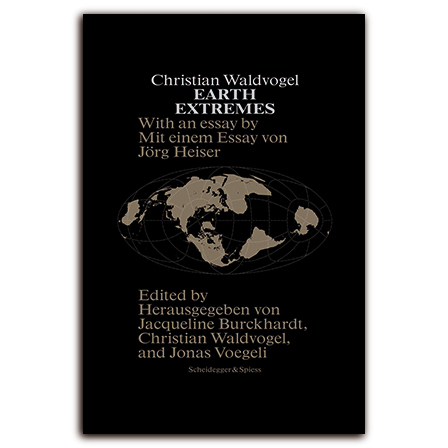 In Top of the World, for example, Waldvogel imagines approaching the Earth from another galaxy, as though he was an alien traveling from another planet. In another, Waldvogel imagines Galileo’s fate had he the opportunity to observe the Earth from the Moon. Combining data from space research with experimental art and imagination, Christian Waldvogel. Earth Extremes offers readers a glimpse of what it’s like to travel through the final frontier. Christian Waldvogel. Earth Extremes was named one of 2010’s Most Beautiful Swiss Books and won a bronze medal in the 2010 competition Best Designed Books from All Over the World. Designed by Jonas Voegeli and Christian Waldvogel. , born 1947, is co-founder and editor of Parkett art journal and one of Switzerland's most eminent art critics and art educators. , born 1968, co-chief editor of Frieze art journal and freelance curator and publicist. , born 1971, studied architecture at ETH Zürich and Rhode Island School of Design. He lives and works as a conceptual and visual artist and programmer in Zürich. He has also been appointed co-chair of the Topical Team Arts & Science of ESA European Space Agency in 2011.